These should replace all of the instances of these objects that I have in my game. 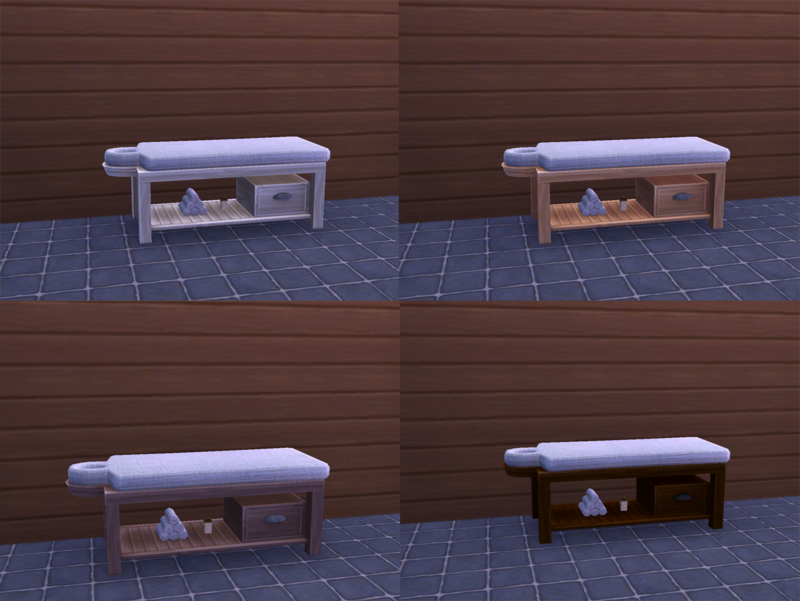 That includes items for the basegame, Get to Work, Spa Day, Outdoor Retreat, and Get Together. If anything for these packs doesn’t show up, please let me know in the comments section or by PM. I would really appreciate it, but do try to make sure it isn’t just something from a pack I don’t have. I'm pretty pleased with most of the items. 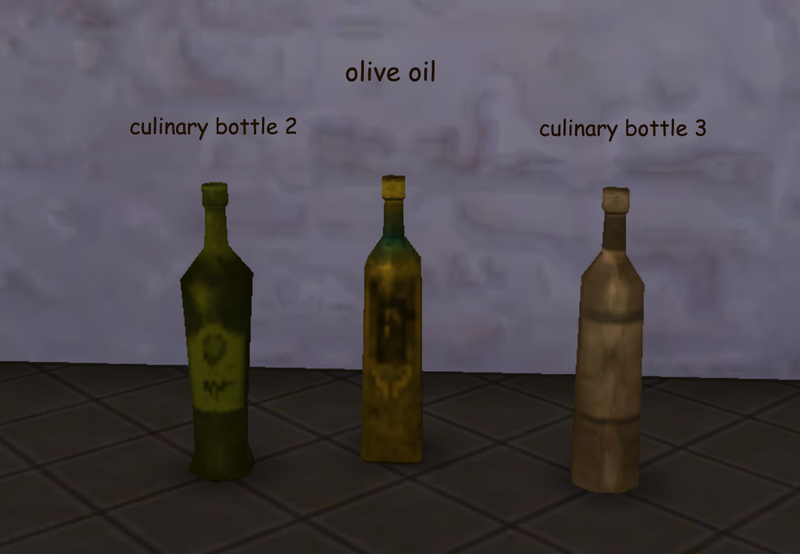 However, I'm not too happy with the cooking bottles. I am not clever enough to redo the shadows and highlights in order for the contours to show up over the ceramic textures, so the labels had to be maintained too. However, I decided to make them available anyway, since they are still an improvement over keeping the contemporary ones. But each item is available separately so you can easily switch them out for better ones if/when someone else creates them. The forks and spoon come in two textures - pewter and forged iron with twisted handles. 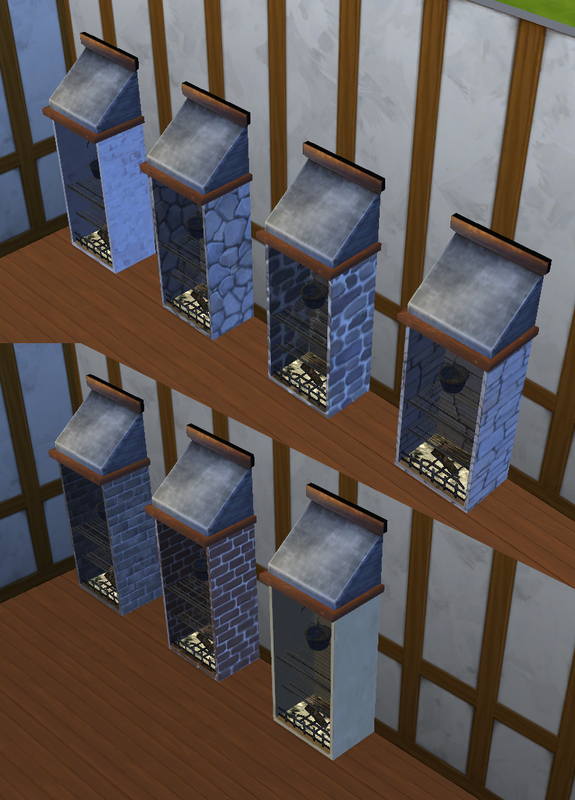 The iron ones looked terrible as overrides, however, so are only available as deco objects. Credit for the pewter texture goes to Shastakiss. 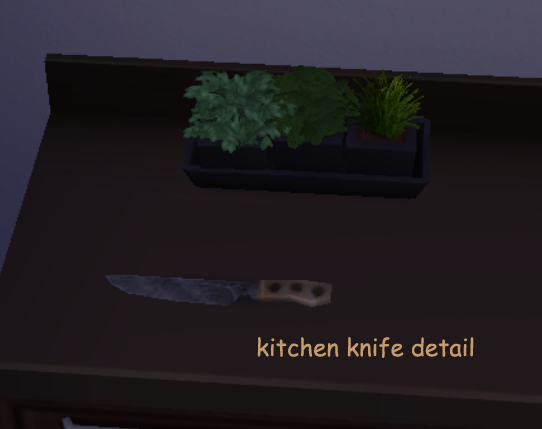 My favorite piece is the kitchen knife. It has a bone handle and the forged iron looks great on the blade. You can also easily find my cc in the game catalog by typing “merry” in the search field. 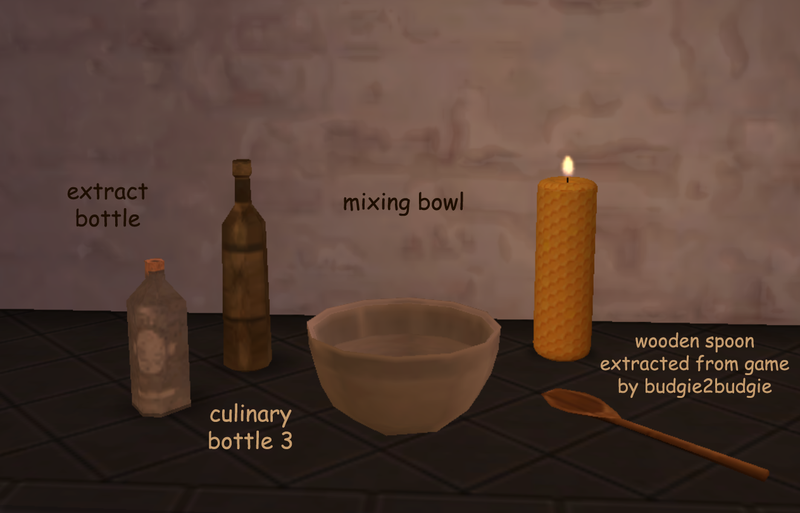 I will be making another set of kitchen overrides and, eventually, overrides for the basic cooking books. My W.I.P. is here. 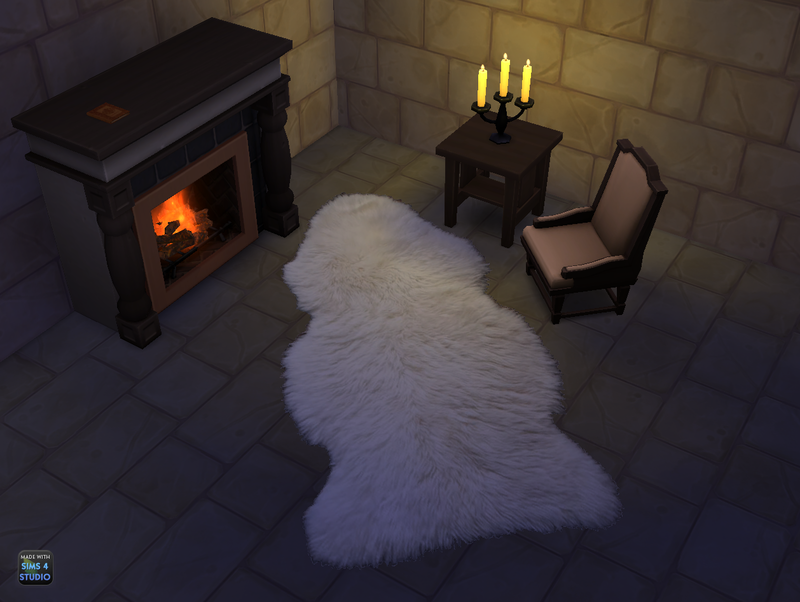 This lambskin rug is 2x1 tiles, but can be enlarged to 4x2 with the command Ctrl + ] for extra versatility. You can easily find my cc in the game catalog by typing “merry” in the search field. This is a set of 5 pieces of art work by M.C. Escher that have been modded to give off a focused aura. This object is quite cheaty. 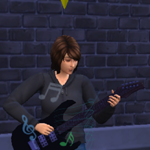 A Sim who views it as a focus painting or is near it while the aura is enabled will instantaneously become very focused. 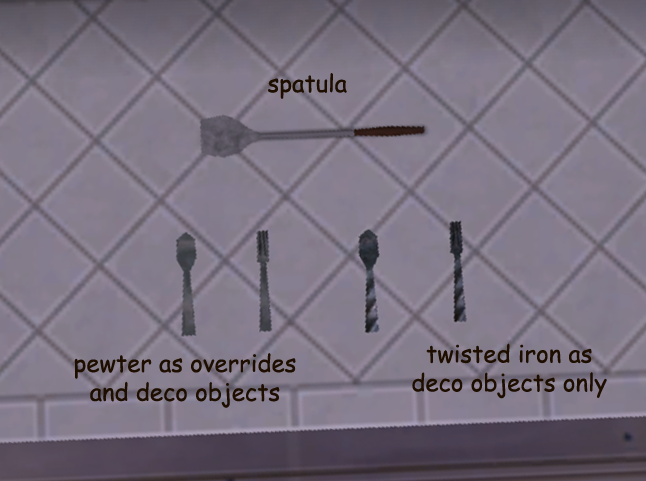 Here is the second set of overrides and deco objects for my rusticized kitchen project. Deco objects include all of these except the egg, measuring cup, and frosting bag, as there are better deco egg meshes out there and the measuring cup and frosting bag only clone partially. 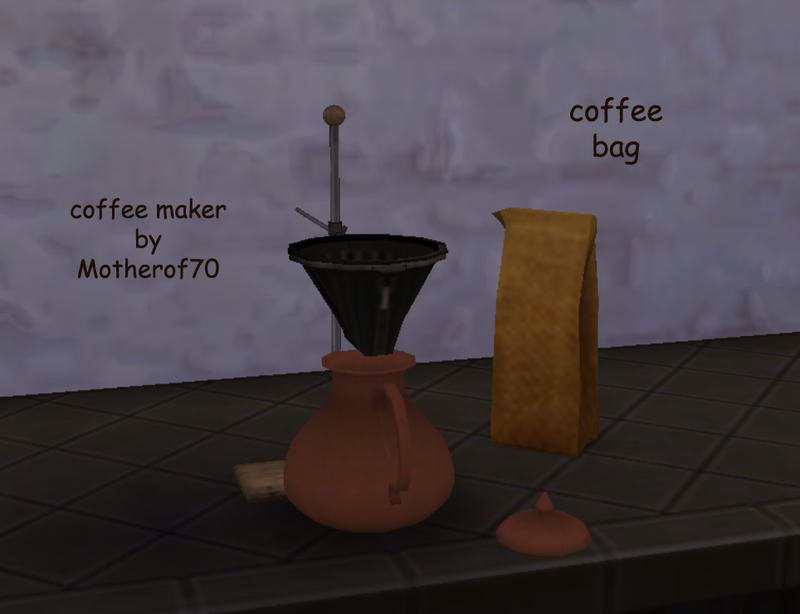 However, you can have both the candy bag and the sugar bag as deco objects. The small ingredient bowl on baking prep board matches the large mixing bowl in set 1 and the butter is now a softer, more buttery yellow. The override egg now has the nice brown texture that Maxis made for this instead of unmatched white. I had been unsure of how to approach the baster, but it seems that many people agree that when you want something round that can be inflated and you don’t have rubber or synthetic materials, you would naturally use pig bladder. So pig bladder it is! You have two choices to replace the candy bag used for decorating cookies - a burlap one with the garish Maxis candy still in it or with turbinado sugar instead. The frosting bag is now in a linen texture. I used the same linen texture, made somewhat dingier, on the cleaning sponge too. It doesn’t look much like rags, but at least it isn’t flagrantly “wrong” anymore. Please let me know if there are any problems with these items. I tested them in game and everything was fine as far as I know. I have the base game, Get to Work, Spa Day, Outdoor Retreat, and Get Together. 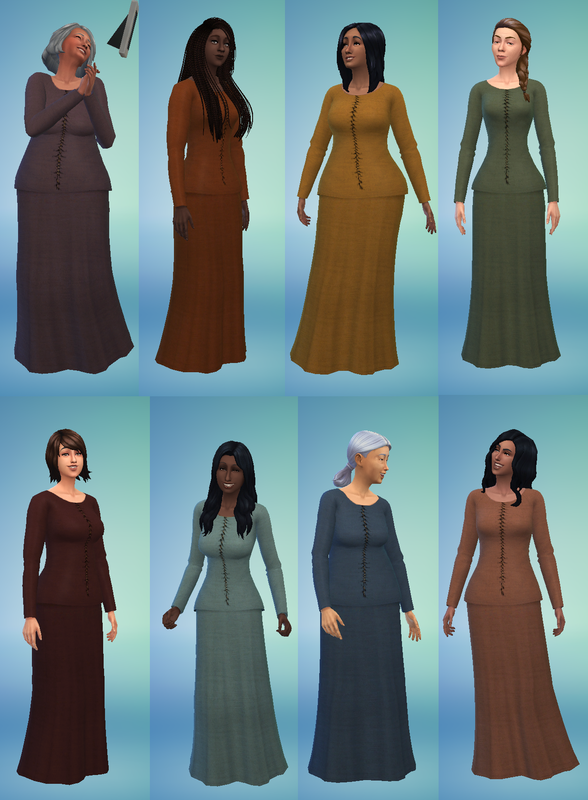 Recolors of a Maxis top and the long skirt for use in Medieval European themed games. They come in all 70 of Shadowfell’s natural dye color actions. Even the idea to use these particular separates came from another creator, Mara, who has some fancier versions here. You can use the “My CC” feature of Studio to reduce the overall number of swatches if 70 is too many, but I’ve also included two smaller sets of 8 – the brights shown in the first picture or the muted colors shown in the second. **UPDATE** K9DB has requested that her toy mesh not be included. Please reupload and get the mesh here if you downloaded before 1-21-16. I apologize for any inconvenience caused. 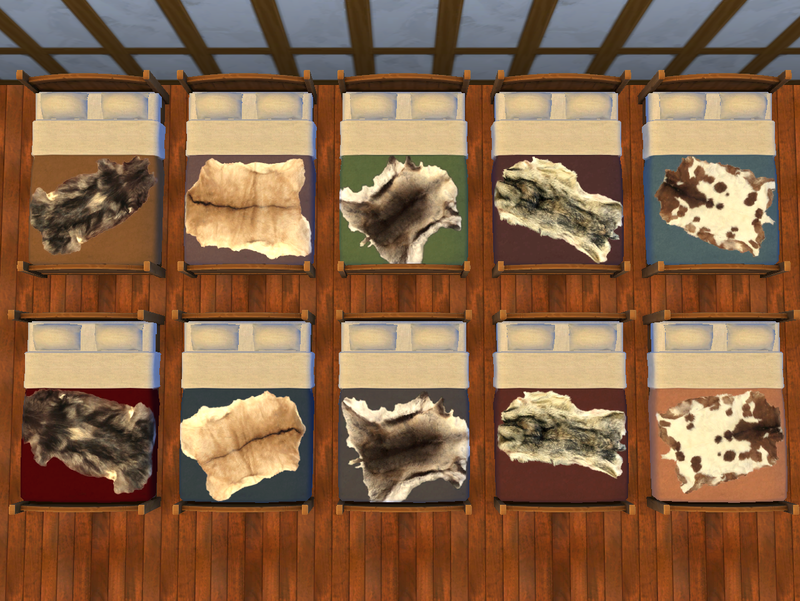 This is a set of 10 meshes for a kid’s room with coordinating recolors. 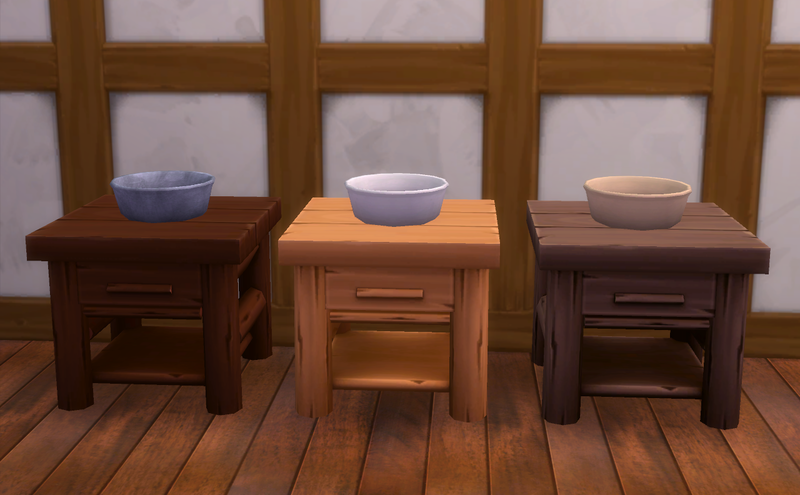 I’ve mixed and matched the 5 main pieces of furniture from three separate sets. Each comes in dark, medium, and light brown plus federal blue and butter yellow. 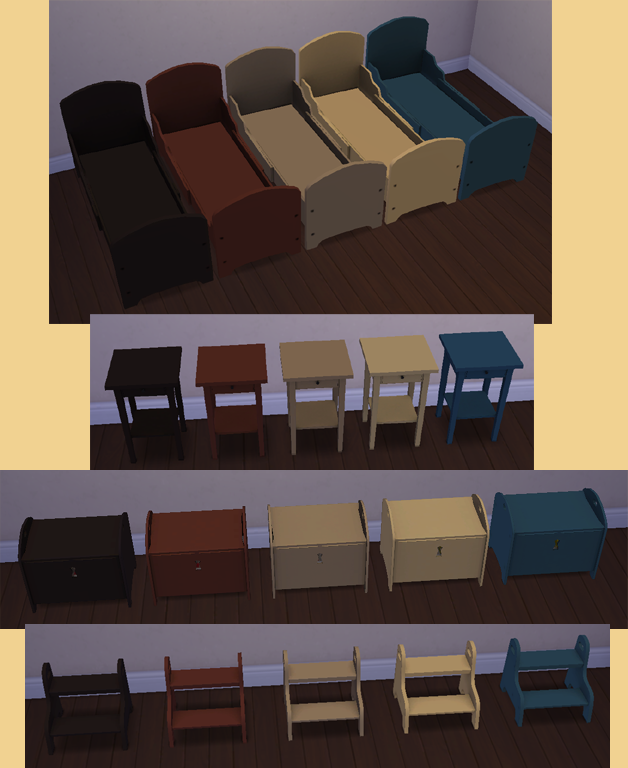 You will need the originals from Sandy at Around the Sims for the bed, footstool, and toy box meshes here. Get the required mesh from Around the Sims here. 5. 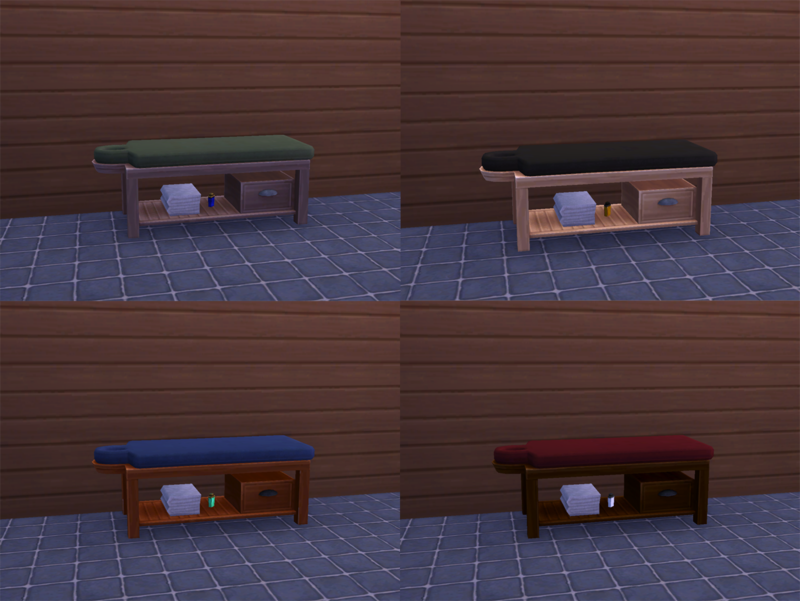 IKEA Hemnes dresser converted from TS2 by Veranka (5 solid colors only, mesh included). Get the required mesh from Veranka here. There are recolors of the game science activity table that match the browns here. Please get the mesh here. 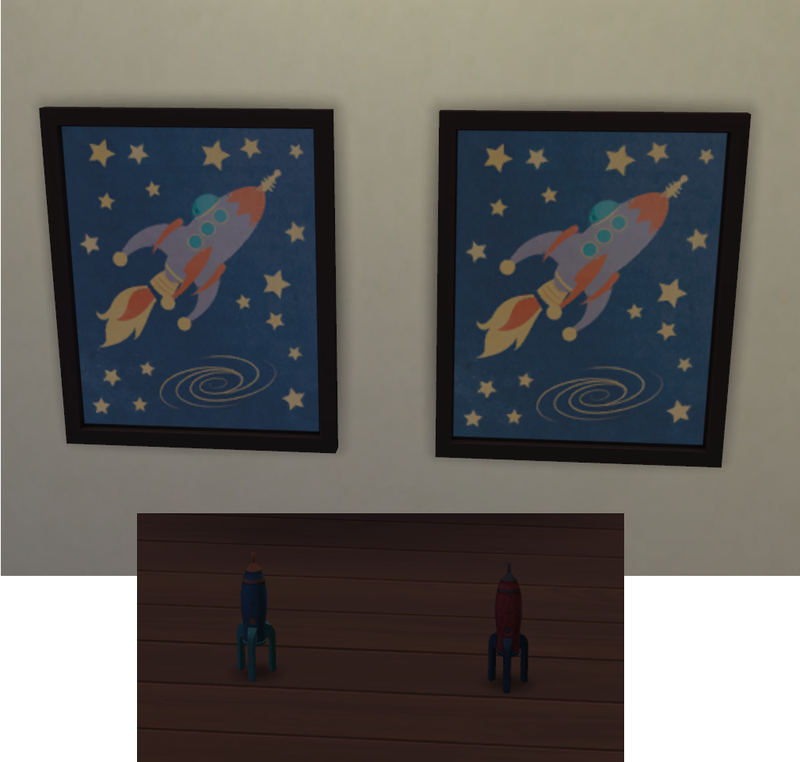 The main download below is for everything except the wall art in a merged package. Deco rocket ship wall art here. 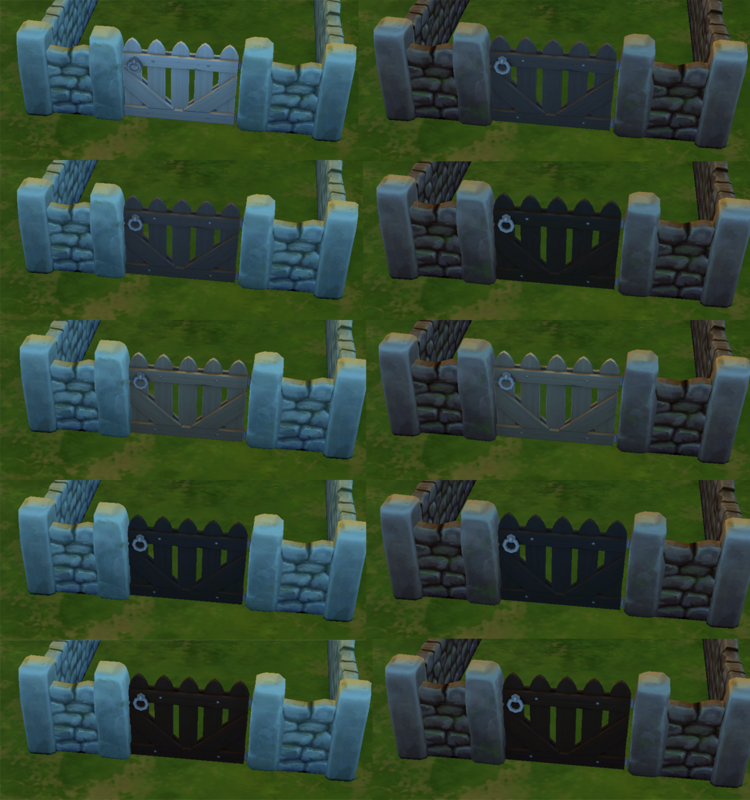 This gate goes with the game Cobbled Fortress fence and has stone posts to match each recolor of the fence. However, the 6 stone colors only have one option for the wooden door color each and I wanted dark brown to go with the tan stone! Easy to swap out textures, but why not make a project of it, so that we will be able to have whichever combination our hearts desire? You can easily find my cc in the game catalog by typing “merry” in the search field, so you know who to blame. 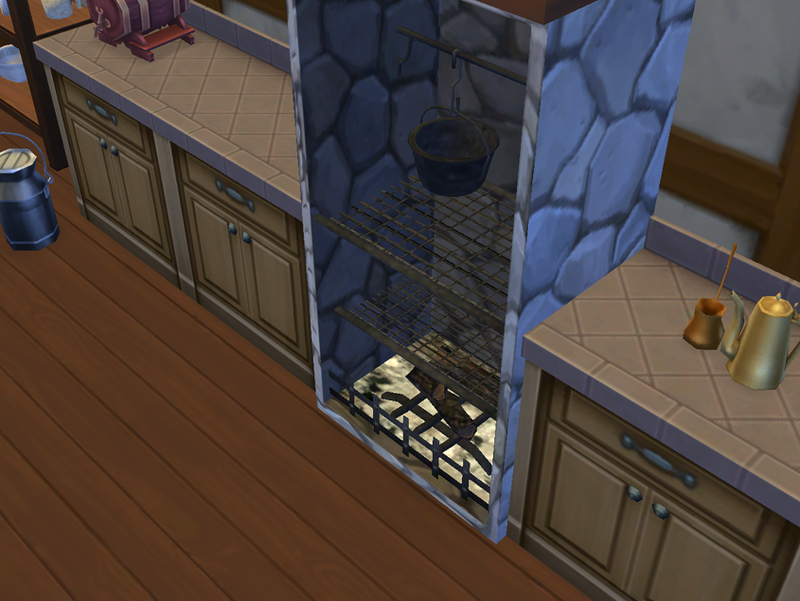 Design4Sims meshed this beautiful and indispensable functional stove. I retextured almost everything, including the ashes, cast iron parts (although it doesn’t look much different from the original), and wood hood surrounds. I also created a new grate at the bottom that I’m pretty happy with. The grills, the logs, and the metal part of the hood remain unchanged. Edit 3-30-16: You will need to get the original here for these to show up in your game. It seems that Design4Sims has deleted her account and I cannot find her elsewhere on the web. 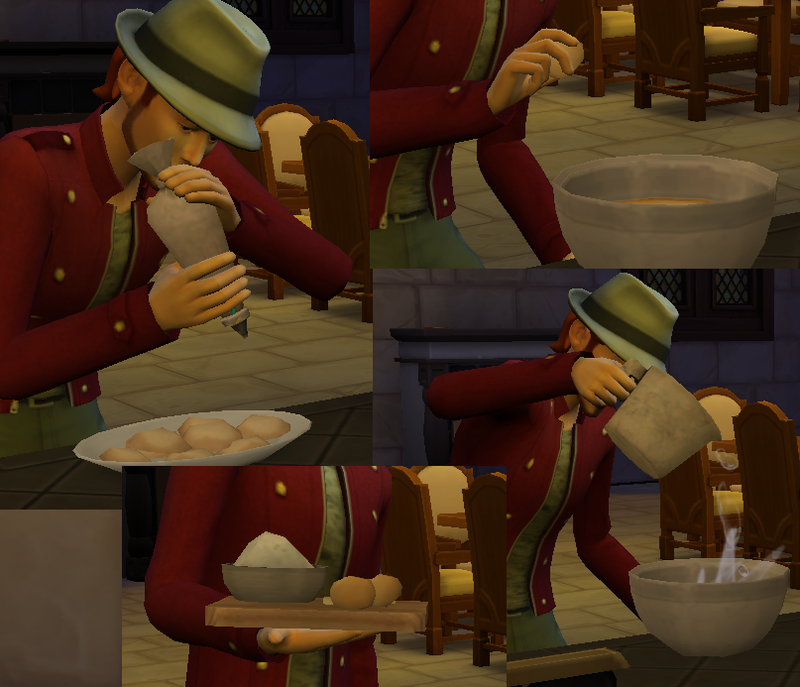 If you do not already have the original stove, this probably won't work for you. I'm very sorry, but there's not much I can do about this. This stove is unbreakable, doesn’t get dirty, and has a cooking quality of 5. The logs underneath are also a functional fireplace and give off the cozy fire buff. 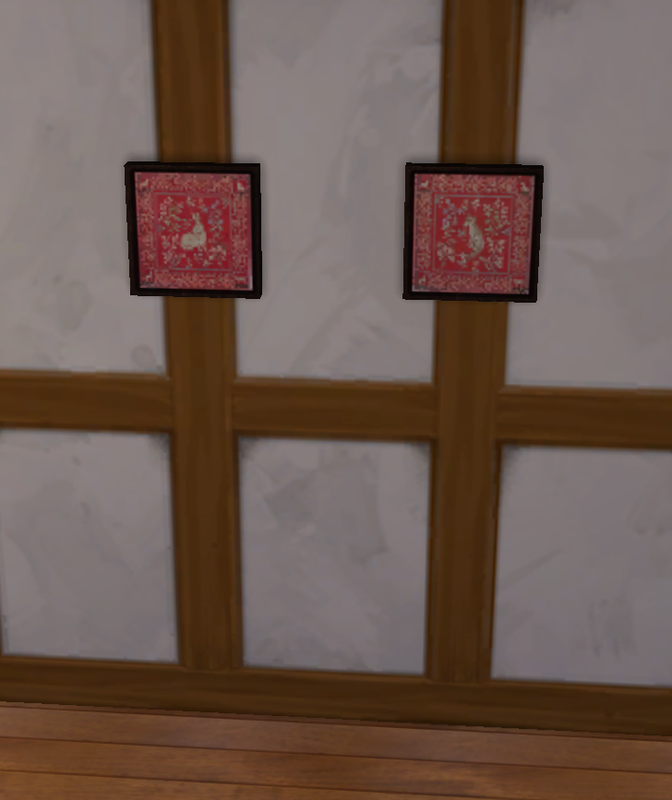 Isn't Design4Sims clever? Here are 4 sets of baby animal themed pieces of wall art for the nursery. There are 8 images, mostly contemporary needlepoints or reproductions based on Tudor era tapestries. Each set has all images in a different colored frame. You can have them as overrides of the game bunny, bug, dino, and elephant nursery art or as stand-alone recolors. Get all recolor packages here. Get all override packages here. Pick and choose your packages here. Here is a set of 3 beddings in 10 colors each – a selection of Shadowfell natural dye color actions on my wool texture with aqualegia linen sheets on double and single mattresses and the same wool and linen bedding on the double mattress with animal hide throws. 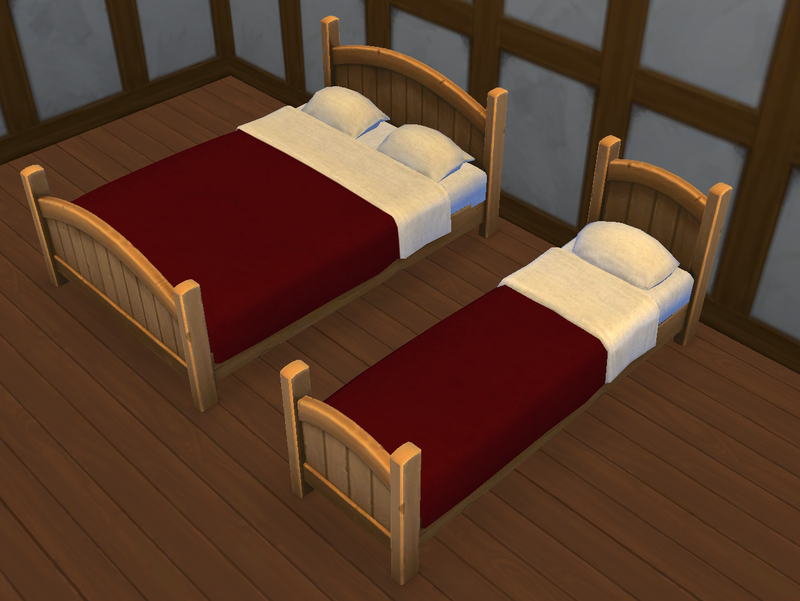 You will need to get orangemitten’s Sophia Selectables double bed mesh here for the double beds to shown up in game. 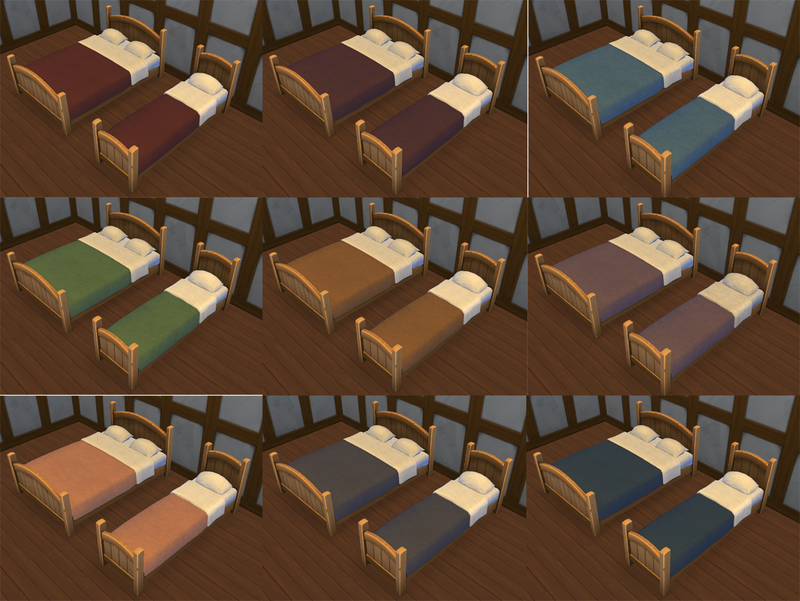 You will also need to get Veranka's single bed mesh here for them to show up. Here are some recolors of the game leggings for girls, made unisex and retextured in wool. 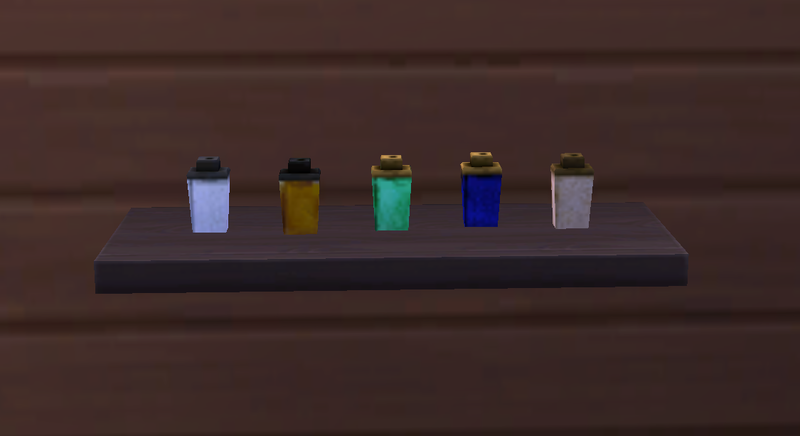 They come in 14 Shadowfell natural dye color actions (not all shown). When I made them, it was with the express intent of having something to pair with wiccandove’s wonderful tunics for children, which my two child models are wearing with their new leggings in the pic above. The leggings are not all matched to the tunics, but there is something to coordinate with each of wiccandove’s seven tunic colors, as you can see. Here are 5 recolors of plasticbox’s functional wash bowl in solid off white and beige, Shastakiss pewter, a grey ceramic glaze, and white ceramic with a green border. See plasticbox’s notes about how it functions here. 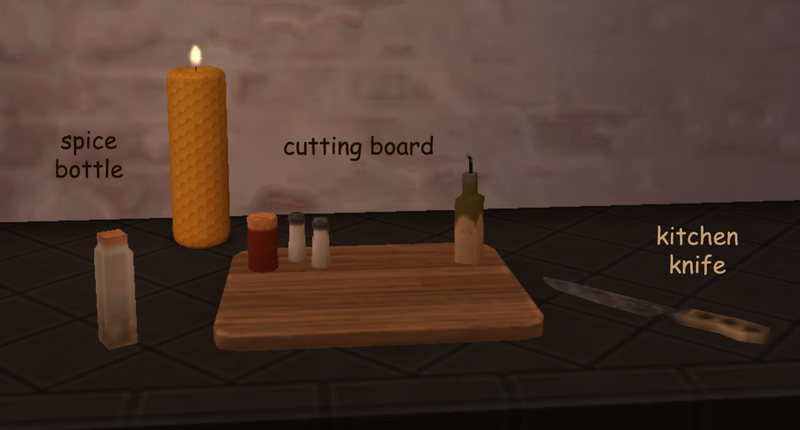 It works great from any number of surfaces in my game, but if you put it on a counter, make sure to switch “auto counters” off first. Thank you to plasticbox for making all their creations available under the Creative Commons license. Items available individually in the download link below. 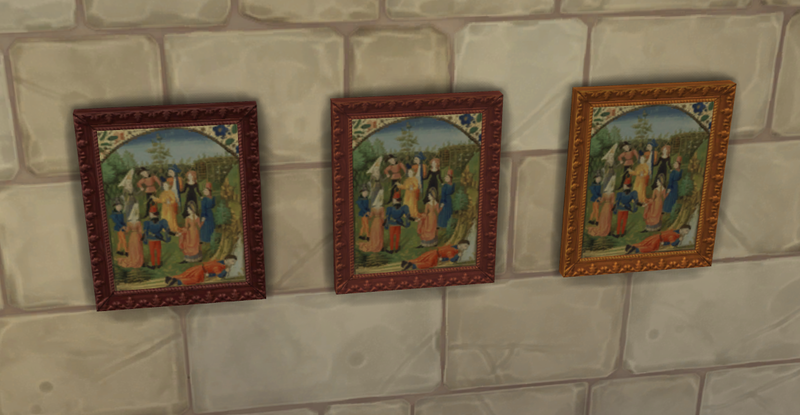 Five images from Medieval illuminations on the base game Still Life frame. I apologize for not having references for most of these. They were images found using an internet image search. 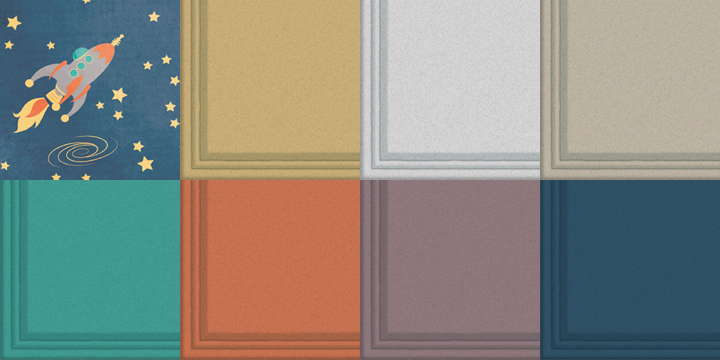 Each image has three frame colors to give 15 swatches in all.